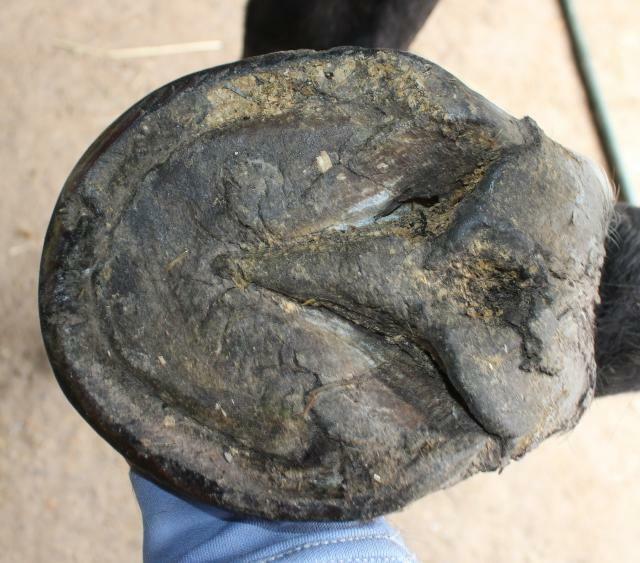 We at Daisy Haven Farm, Inc, focus our practice on rehabilitation of the equine foot. We do our best to be objective about the work we do on the horse’s foot and refrain from following trends or fads. We are committed to continuous education and remain open minded for the good of the horse. One of the most influential tools we use to remain objective is our CR digital radiograph system. Think of it as a fancy hoof gauge. For the work we do in rehabilitation, it is invaluable in facilitating accuracy of the trim. I am constantly amazed at how the external landmarks of the foot are misleading when I am able to check my evaluation of the foot with digital radiographs. We are usually referred to rehabilitation cases by the veterinarian directly. The veterinarian has already done the diagnostic work and calls us to help with rehabilitation of the horse’s feet. We work closely with the veterinarians while working on these cases. It is very rewarding, great teamwork and is critical for success. Here is an example of a case where progressive series of hoof radiographs played a key part in rehabilitation. 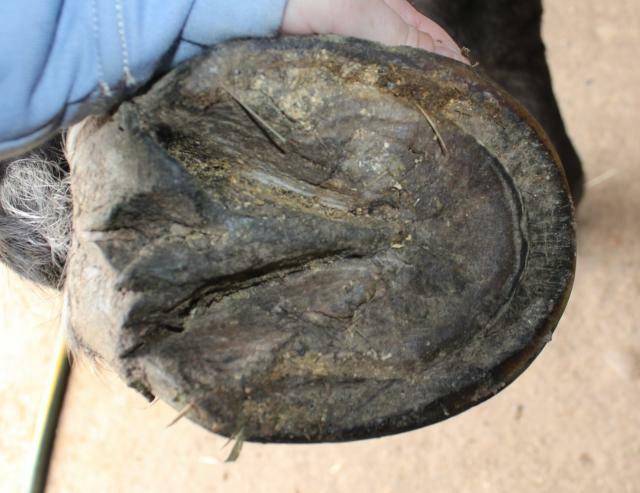 This is the case of an Arabian mare who had foundered initially five years ago. She had been maintained well until two years ago when she fell apart again. I was called in to help in April of 2012. The mare’s owner had worked diligently with the veterinarian to control her insulin resistance (IR). She was acutely lame (Obel Grade 3), and while the previous farrier had been doing the best job he could, her feet were not improving over time. Hoof boots were helping keep her somewhat comfortable day to day. The veterinarian did not own a digital radiograph machine and asked me to use my radiograph system to assist with trimming decisions. 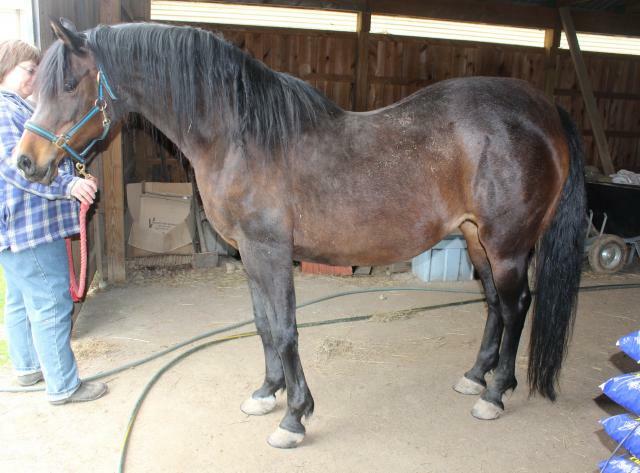 This was the horse's body condition in April. Her weight here is 1057 lbs. Note her cresty neck, channel down her back, and fat pads at her shoulder and tail head. She also has fat pads above her eyes, but you can't see them in this picture because of her beautiful forelock. I have had abundant success in returning these horses to long term soundness: a 99% success rate over 10 years, working on 1,008 insulin resistant foundered horses to date. Exercise: when appropriate, implementation of exercise will help keep the horse healthy long term. One of the biggest failures I see in long term soundness of the insulin resistant horse is hesitation to get the horse back in work (when they’re ready!). 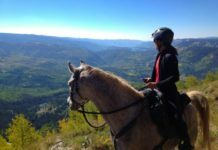 Please see www.ECIRHorse.com for more information on this protocol. Diagnosis: the veterinarian provided an accurate diagnosis and supportive care. Diet: her diet had room for improvement based on Dr Kellon’s protocol. Seeing all the grass available to this horse on the farm, even with the muzzle at times, it’s no wonder she was having problems. 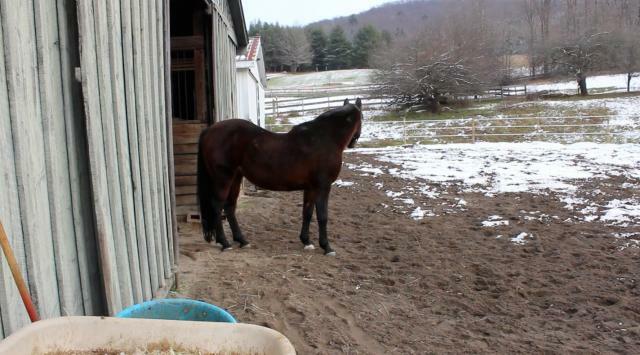 Her owner created a small dry lot with this round pen until a bigger dry lot could be added. She also began weighing the forage provided and switched to Triple Crown Safe Starch, a safe forage for IR horses. Note the dish in her wall, and stretched white line. 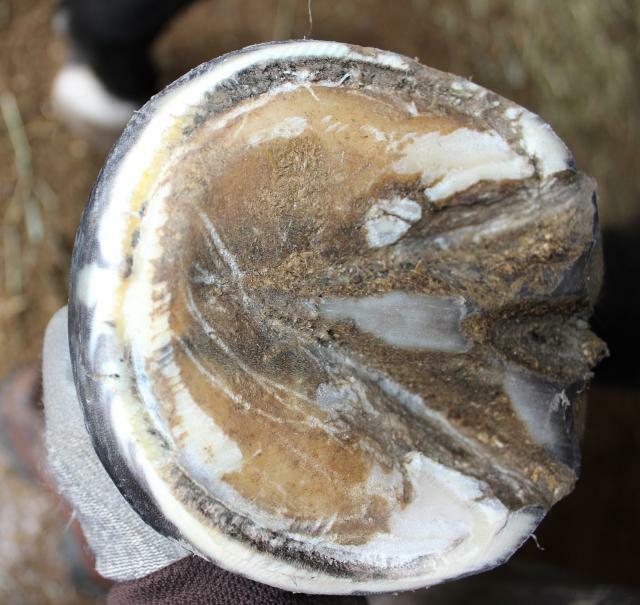 phalangeal rotation: when the hoof capsule is centered around the coffin bone, but the bones of the distal limb are out of alignment. The benefit of being able to take a progressive series of radiographs is accuracy in our trim with those goals in mind. 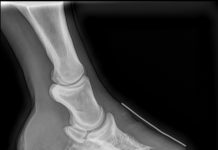 Many times I’ll come in and trim a foundered horse, re-take the lateral radiographs after the trim and realize even though I felt that I had removed a ton of distortion from the horse’s foot, there was still more room in the foot to improve the alignment. We feel being able to be this accurate in our work shortens recovery time and facilitates the return to soundness of the foundered horse. 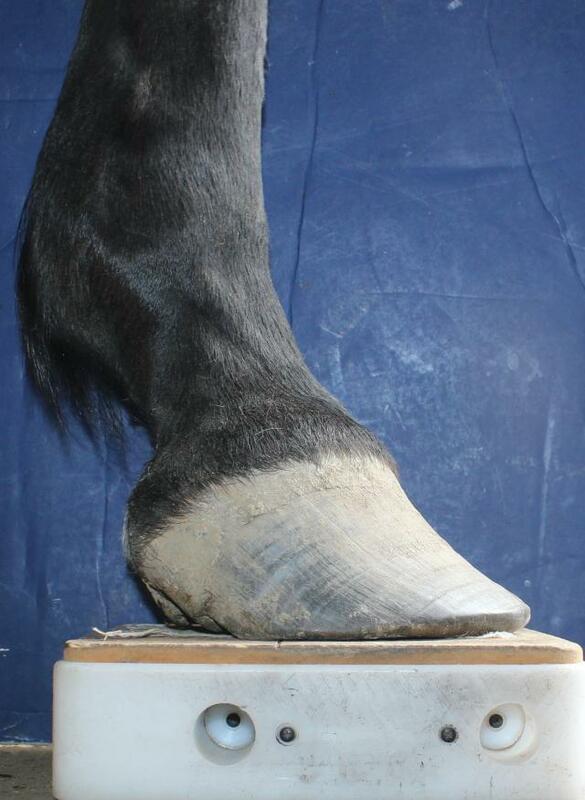 Here are the mare’s feet with the progressive series of digital pictures and radiographs from April 2012 to Nov 2012. Digital pictures were taken at every visit, however, digital radiographs were only taken in April and November. On April 14th, upon seeing the After Trim radiographs, I was able to adjust the trim a little further in order to get closer to our goal. 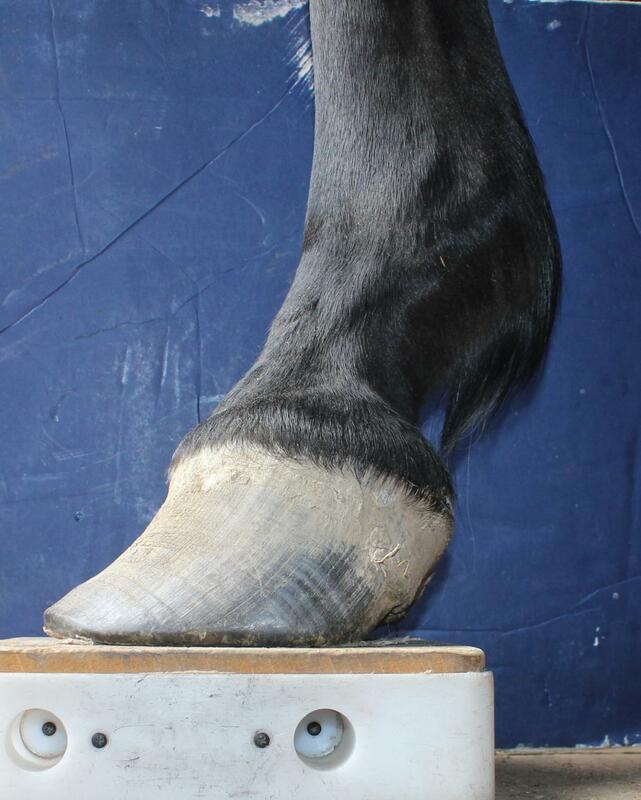 I now had a more complete understanding of what my trim was specifically doing for this horse's feet, which enabled me to be more accurate and effective in future trims as well. Exercise: Immediately after the first trim, this mare was much more comfortable. After the first month she was able to be turned out in the field with a sealed muzzle for a period of time each day. I believe the exercise facilitated her recovery. She is currently 100% sound and has been since June 2012. This past fall a larger dry lot was completed for her to have more consistent movement all day. At the 2007 Laminitis Conference in West Palm Beach FL the predominant message was to monitor insulin resistant horses based on their body condition. 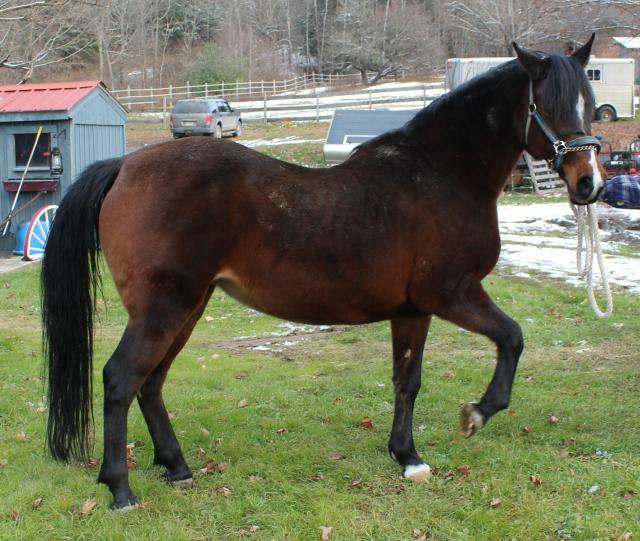 This mare's weight is now 848 lbs as of January 2012. 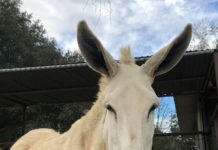 Now that her body condition is more healthy, the horse owner can watch for any return of fat pads as a red flag to call the veterinarian before her feet act up again, hopefully preventing future laminitic episodes. If your horse has fat pads, please talk to your veterinarian about the risk of insulin resistance and be proactive to improve his body condition before laminitis occurs. 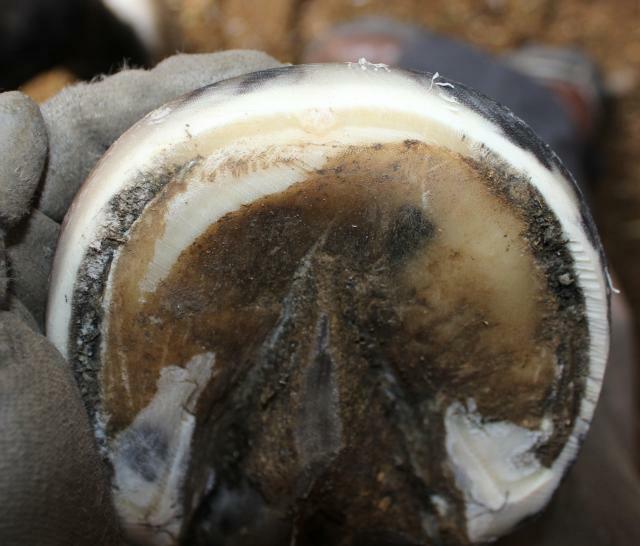 The advantage of progressive series of hoof radiographs, meaning radiographs taken before the horse is trimmed, then right after the horse is trimmed, then potentially again after any changes are made, and again after any prosthetic device is added is immensly valuable to the farrier. If you are dealing with a foundered horse, please talk to your farrier and veterinarian about utilizing radiographs this way. We truly feel being able to be this accurate in our work not only shortens recovery time and facilitates the return to soundness of the foundered horse, but is also why we've been successful on some really difficult cases and have such success overall. 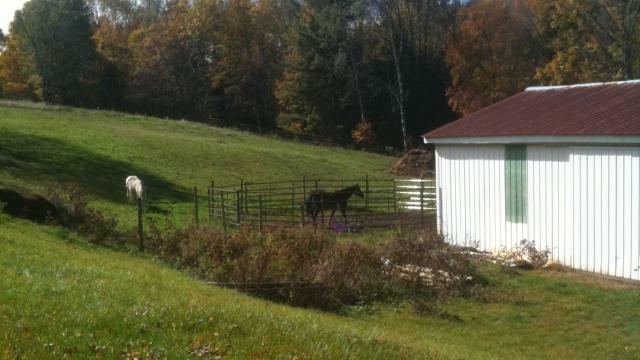 For more information about other horses we have rehabilitated using this protocol, please see www.DaisyHavenFarm.com.